This classic peppermint bark recipe is the perfect party treat or DIY Christmas gift! Just four ingredients, and so simple to make. I am definitely NOT a crafty person, but I love the idea of crafty things, especially DIY gifts! This winter, I’m sharing five easy DIY Christmas gifts, the kind that even us ‘not so crafty’ people can pull off. 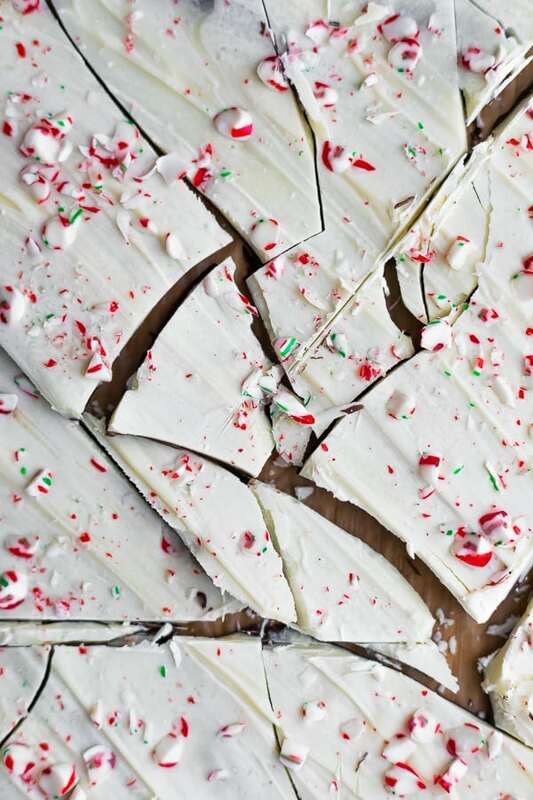 This peppermint bark recipe gets top marks for ease and for flavor! 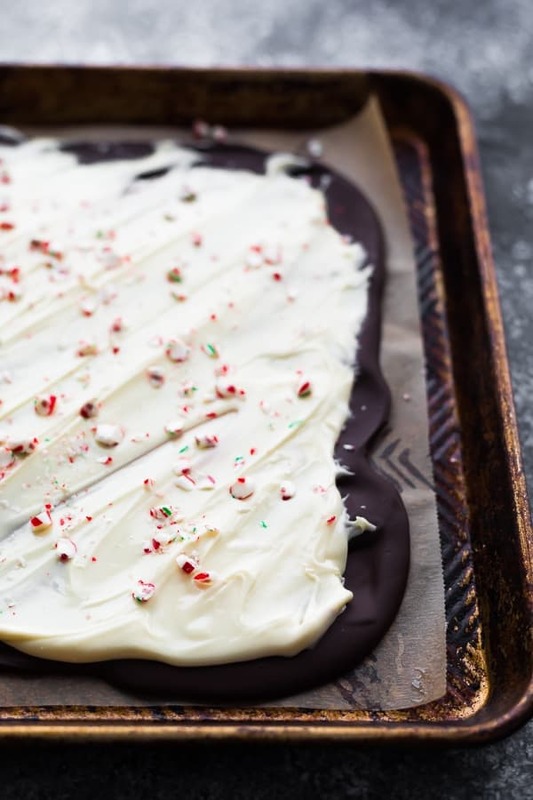 This peppermint chocolate bark is so easy, you really only need a couple of 15 minute sessions to get it done! 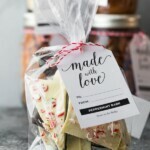 This is perfect if you are super busy during the holiday season, but need a quick hostess gift. It’s pretty and so tasty! 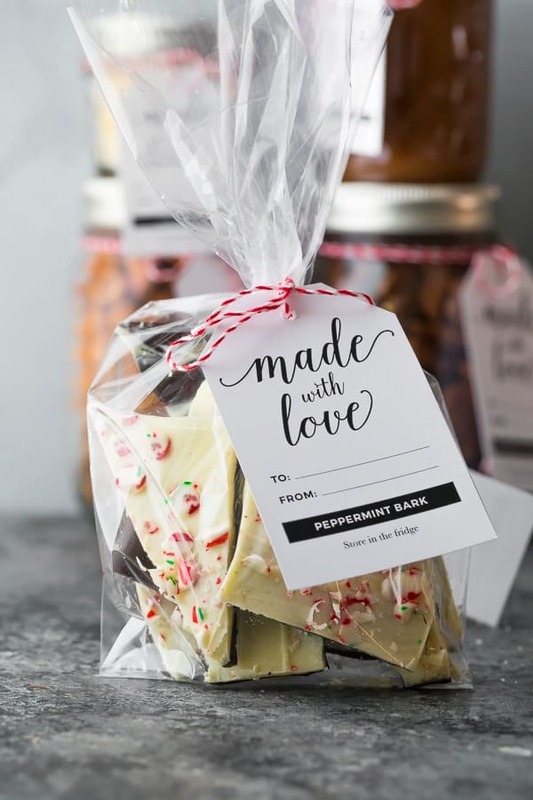 Get your free printable Peppermint Bark Gift Tag here! it’s perfect for a party treat or to give as a gift! Well…technically, all you need to do is melt some chocolate! Although if you’re like me, you may have had issues with scorched chocolate in the past, so I recommend skipping the microwave and going for a double boiler. 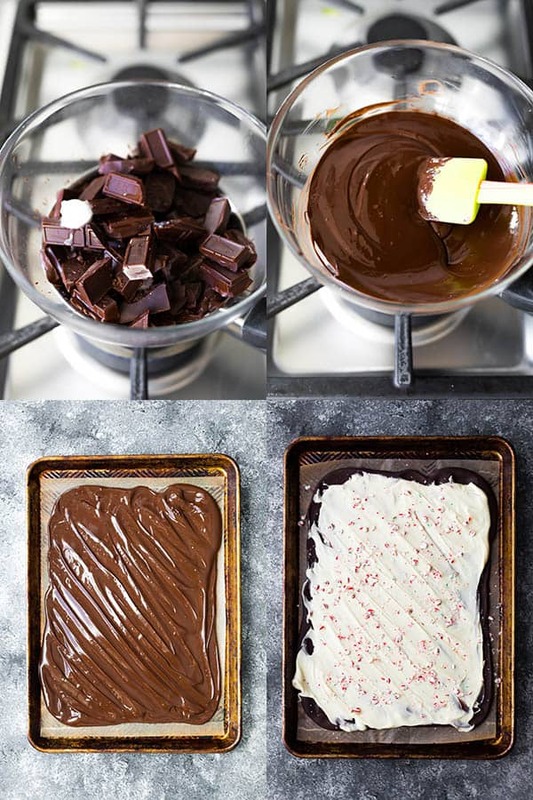 Melt chocolate in a double boiler with a touch of coconut oil and peppermint extract. I used a mix of good quality dark and semi-sweet chocolate. Pour over parchment-lined baking sheet. Refrigerate for 30 min-1 hour. Melt white chocolate in double boiler with coconut oil & peppermint extract. Pour over chocolate layer. *work quickly* and spread it evenly over top. Scatter with chopped candy canes and refrigerate overnight! Can I melt the chocolate for this bark in the microwave? Yes, you can, however I have scorched my chocolate so many times in the microwave which is why I prefer a double boiler. If you do go the microwave route, make sure you work in 20-30 second increments, and stir often. Does chocolate bark need to be refrigerated? It’s best to refrigerate to keep it as fresh as possible, and definitely if you live in a warmer climate. That being said, we left our bark out at room temperature here in Canada for a week and it was totally fine. How do you cut chocolate bark? Once the chocolate has solidified (I let it refrigerate overnight), you can transfer to a cutting board, and chop into wedges with a large knife. The batch pictured was on the thinner side and shattered a bit more, if you pour your bark a bit thicker it doesn’t shatter as much. Find the printable gift tags here! 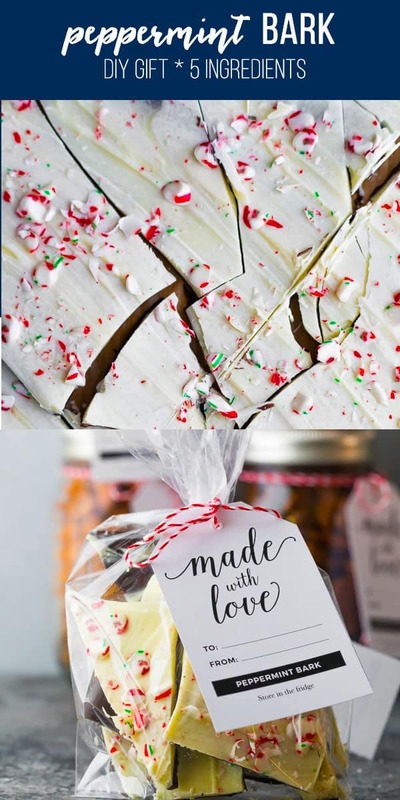 This easy peppermint bark recipe is the perfect party treat or DIY Christmas gift! Just four ingredients, and so simple to make. Spread a piece of parchment paper on a baking sheet (spray baking sheet first with oil to help the parchment paper stick and not roll back up). Prepare the base chocolate layer: In a double boiler, add the brown chocolate, 1 teaspoon coconut oil, 1/2 teaspoon peppermint extract. Stir frequently until melted and smooth, then pour onto the prepared parchment paper. Smooth with a spatula. Refrigerate for 30 minutes- 1 hour. Prepare the white chocolate layer: melt the white chocolate in the double boiler with 1 teaspoon coconut oil and 1/2 teaspoon peppermint extract, stirring frequently until completely smooth. Pour over the brown chocolate layer, and work quickly, smoothing with a spatula. Sprinkle with chopped candy cane. Refrigerate overnight, then cut into bite-sized pieces. You can store at room temperature for up to 1 week (unless you live in a warm climate! ), or in a sealed container in the fridge for up to 1 month.